But the outcome of the contest between Democrat Conor Lamb and Republican Rick Saccone DOES matter. It matters because a victory clears the field for Lamb or Saccone when it comes to the new congressional districts where they’ll likely run in November (PA-17 for Lamb, PA-14 for Saccone). 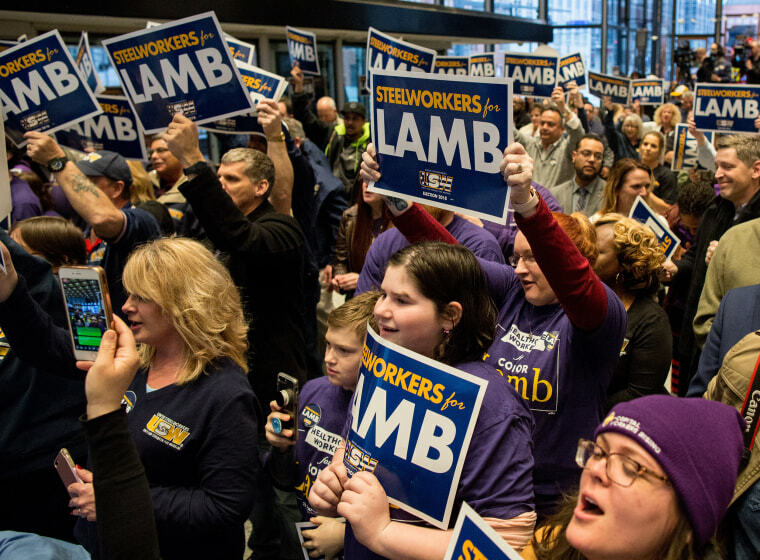 “If Lamb (D) wins, he'll be in a much stronger position to take on Rep. Keith Rothfus (R) in #PA17 in the fall (in fact, he'd probably be a slight favorite). If Saccone (R) wins, he'll have inside track for #PA14 to the south,” the Cook Political Report’s David Wasserman tweeted. It matters because a GOP loss tonight could possibly lead to more Republican retirements. “If [Lamb] wins, you’re going to see probably another half a dozen Republicans say they’re not running again,” former Vice President Joe Biden said while campaigning for Lamb last week, per the New York Times’ Jonathan Martin. It matters because if they win, Lamb or Saccone would get incumbent-protection services as a sitting member of Congress. And it matters because of the campaign messages that the parties and candidates are trying to sell voters – like the GOP’s tax cuts, the GOP’s anti-Pelosi ads and the Dems’ argument that they’re running fresh faces who are “stability” candidates. “If GOP can't sell tax cuts effectively in a CD that voted for Trump by 19.6%, where will they be able to in the fall?” Wasserman asks. Polls close in Pennsylvania at 8:00 pm ET. NBC’s Vaughn Hillyard: “Republican congressional candidate Rick Saccone on Monday evening asserted that his political opponents ‘hate’ the president, the United States, and even God. ‘They’re energized for hate for our president,’ said Saccone, standing alongside Donald Trump Jr. in a firehouse in this western Pennsylvania town. He continued, ‘Many of them have a hatred for our country. I’ll tell you some more — my wife and I saw it again today, they have a hatred for God.’” Here’s video of Saccone’s remarks. If you haven’t checked out our new blog on the 2018 midterms and beyond — The Rundown — give it a try. Here’s a link to bookmark and check daily. But guess who hasn’t commented on the poisoning — despite chiming in on past attacks or violence in the U.K.? President Trump. But guess who did single out Russia? Secretary of State Rex Tillerson. “Tillerson says ex-spy's poisoning in UK 'clearly came from Russia,' vows it 'will trigger a response',” the AP says. “House Republicans investigating foreign interference in the 2016 election say they have found no evidence that Russians colluded with any members of the Trump campaign and dispute a key finding from the intelligence community that Russia had developed a preference for the Republican nominee during the election,” NBC’s Mike Memoli reports. But remember, whether it was House Intel Chairman Devin Nunes’ statement outside the White House or their release of the Nunes memo, the House GOP’s credibility and good faith in this investigation ended a while ago. Meanwhile, this new story from the Washington Post isn’t the greatest timing for Nunes & Co. “In the spring of 2016, longtime political operative Roger Stone had a phone conversation that would later seem prophetic, according to the person on the other end of the line. Stone, an informal adviser to then-candidate Donald Trump, said he had learned from WikiLeaks founder Julian Assange that his organization had obtained emails that would torment senior Democrats such as John Podesta, then campaign chairman for Democratic presidential candidate Hillary Clinton,” the Post writes. A reminder: Podesta’s emails were hacked in March 2016; WikiLeaks didn’t start releasing them until October 7. July 27, 2016: In his final news conference of his 2016 campaign, Trump asks Russia: "If you're listening, I hope you're able to find the 30,000 emails that are missing"
November 4, 2016: "Boy, I love reading those WikiLeaks," Trump says from Ohio.